We had a second dusting of snow in a week, just enough to satisfy my craving for a little snow this winter! Snow is rare here and usually fleeting*, so I get that giddy feeling you have to wake on a snow day and find out school is cancelled. 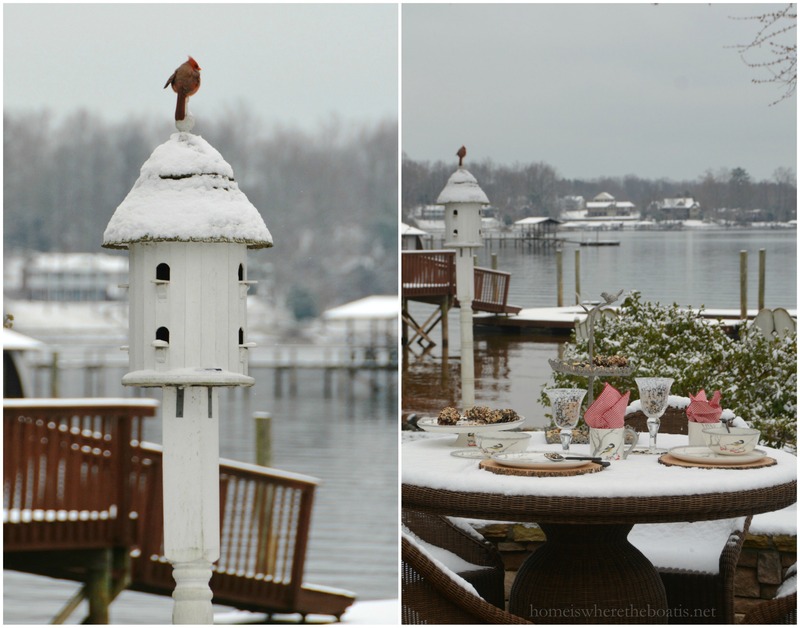 I couldn’t resist the urge to get out and play in it and set a table for our feathered friends. 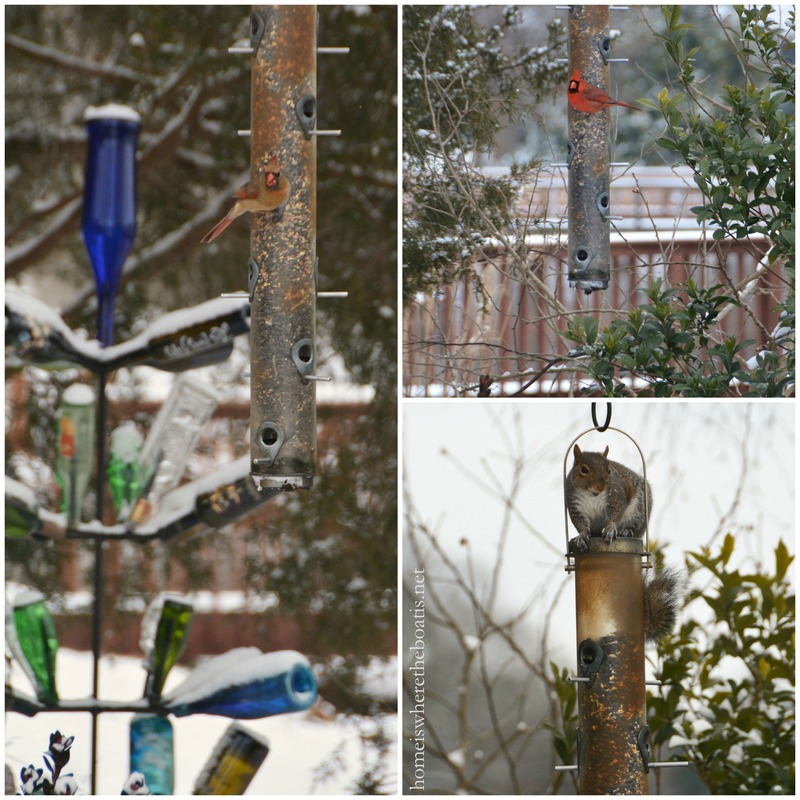 It’s a full-time job keeping our feeders filled in winter . . . If you feed them they will come. . . I set a table for the birds. . .
With some snowy goblets . 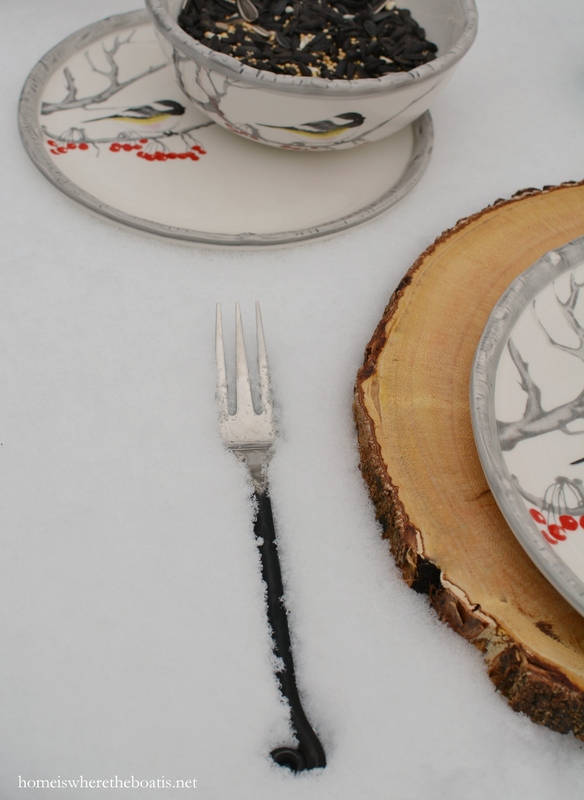 . .
And Winter Chickadee plates served on tree slice chargers. A tiered bird server offers a mixture of seed and peanuts for larger birds~ jays, woodpeckers, grackles and hopefully will keep those pesky squirrels occupied and away from the feeders. 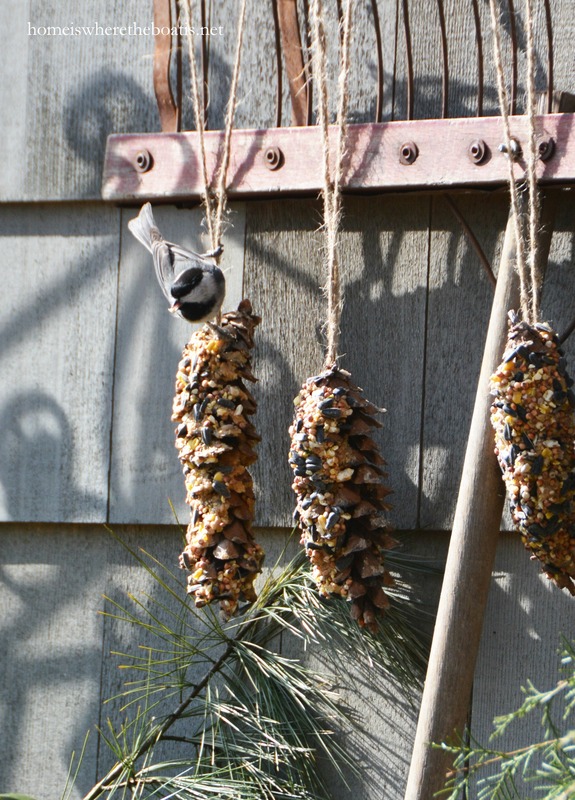 . .
Pine cones make an easy winter feeder for birds with a mixture of cornmeal, peanut butter and seed. 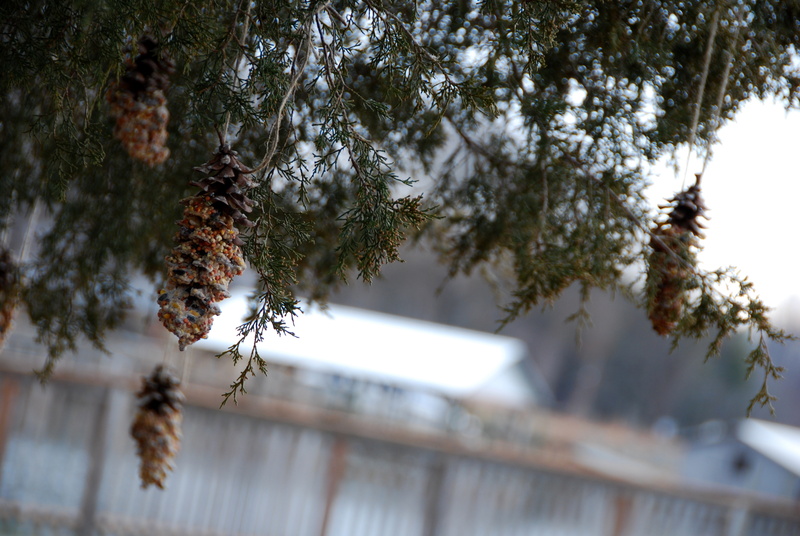 Tie some twine around the pine cone before you coat it in your peanut butter/seed mixture for easy hanging on trees. . .
Or hang some on a rake and watch the Carolina Chickadees feast. . . The guests of honor finally arrived. . .
American Goldfinches wearing their winter coats. 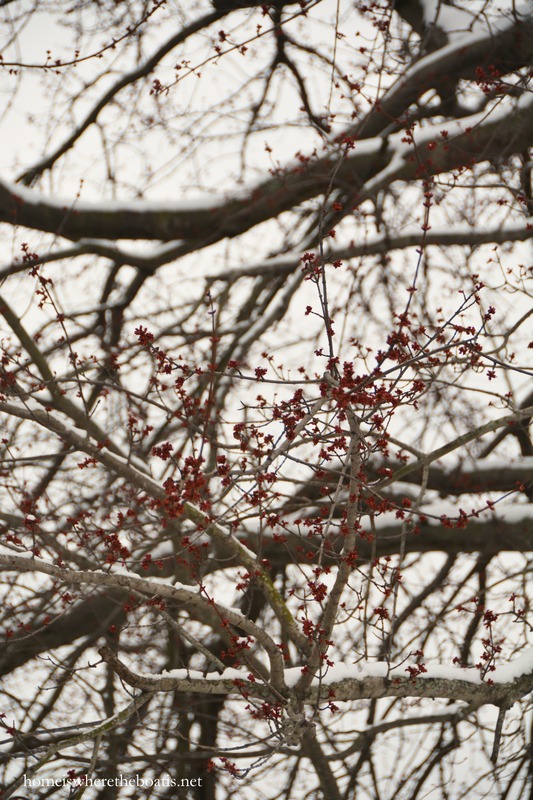 Hope you’re surviving winter and can find some bright color among the gray! Aw, the squirrels need a little lovin’ too:@) (As long as they’re not in my planter garden…) These are some of my favorite plates Mary, I’m glad you got your snow day to play in-enjoy! Such a creative way to set a table, love it! I agree with Lynn about the squirrels. I love watching their antics, and I buy shelled peanuts just for them. (be sure to get unsalted, as they can suffer from hypertension!) I love your little bits of cheery cherry color in the otherwise bleak landscape. Mother nature did good too! Enjoy your snow. If you should run out, I can send more…. Love the cardnal against the snow..so pretty! I am sure the birds enjoyed their feast. 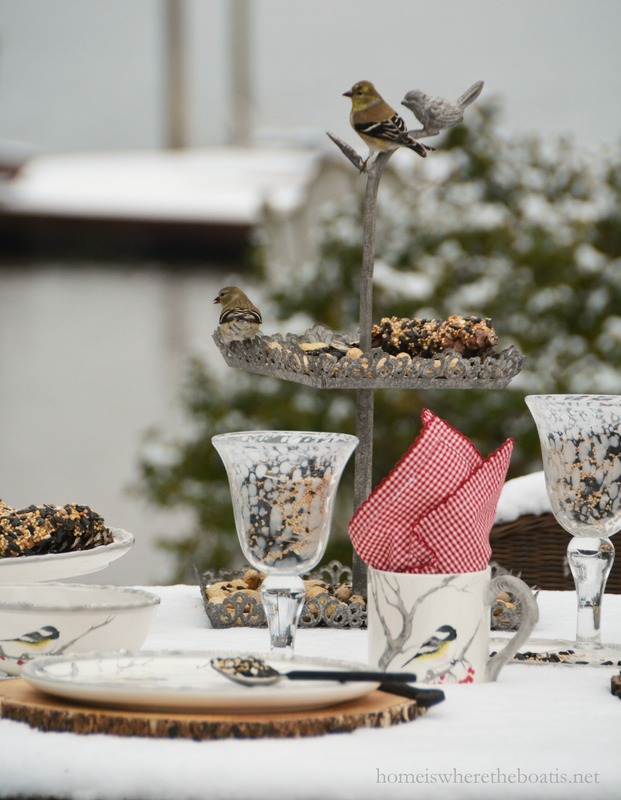 Lovely table setting for your feathered (and furry) dinner guests. 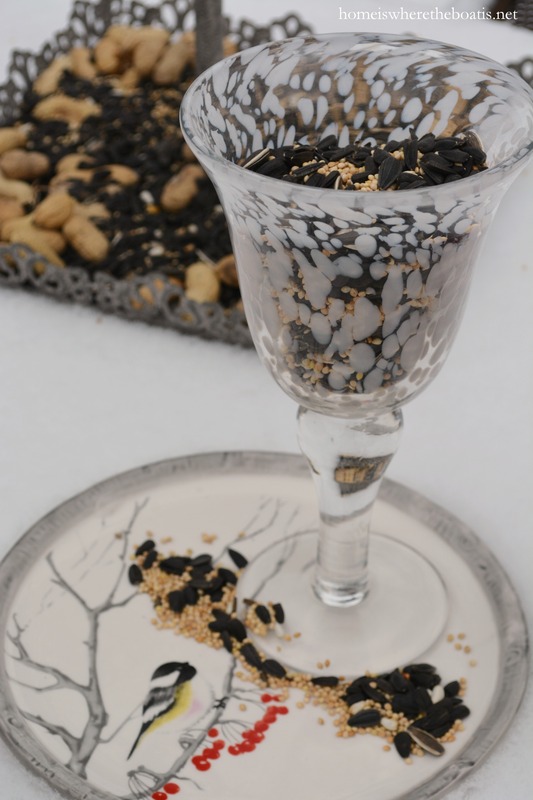 You definitely raised the creative bar on serving birdseed! Beautiful photos – thank you! Oh my gosh those goldfinches feeding and perching on the tiered server are just too much. Just a lovely, lovely post! Thank you. The animals add such joy to our days, especially during the long, cold days of winter. Thanks for the uplifting post. Our son and DIL are coming for a visit tonight, weather permitting their arrival time as y’all are in for that winter blizzard. They live in Myers Park, just south of Charlotte, not far from you. Keeping my fingers crossed their flight won’t be delayed. 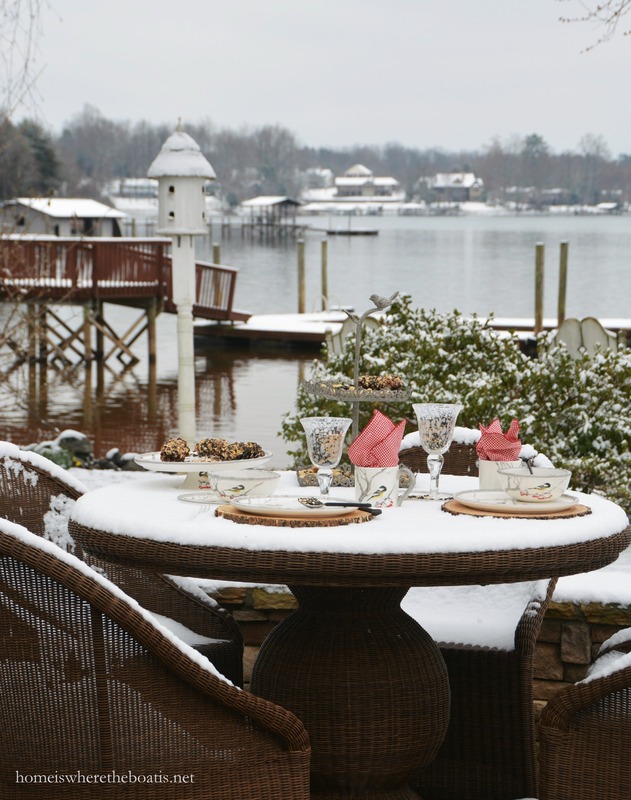 Stay warm while enjoying your beautiful lake view. Nice table, Mary. We only got a dusting here in WV, thank you very much. I picked up the Flea Market Gardens and really enjoyed your feature. Still want to replace my hot tub with a garden shed….your article really had me dreaming! Good morning Mary! Thank you for caring for the birds and squirrels! Good job! Know what you mean about filling the feeders! It’s part if the routine but when you have 8 or so inches of snow, you have to still dress like a kid. Boots, coat, hat, gloves & scarf. All done, oops, gotta go to the restroom!! Anyway, keeps us moving and our birds alive and well. The table is beautiful! I especially like the goblets. I have been trying to find those & the red ones. Have a fun day in your snow!! Now we know that you had to be out in the cold for a bit in order to set all that up and take pictures of it. Thank you for the effort. The settings are gorgeous and the birds are just adorable. I love the squirrel. He needs some loving too. I’m betting my Maine birds are missing their daily feed and I hope they can find something to eat through all the inches of snow. What a winter so many are having to endure. 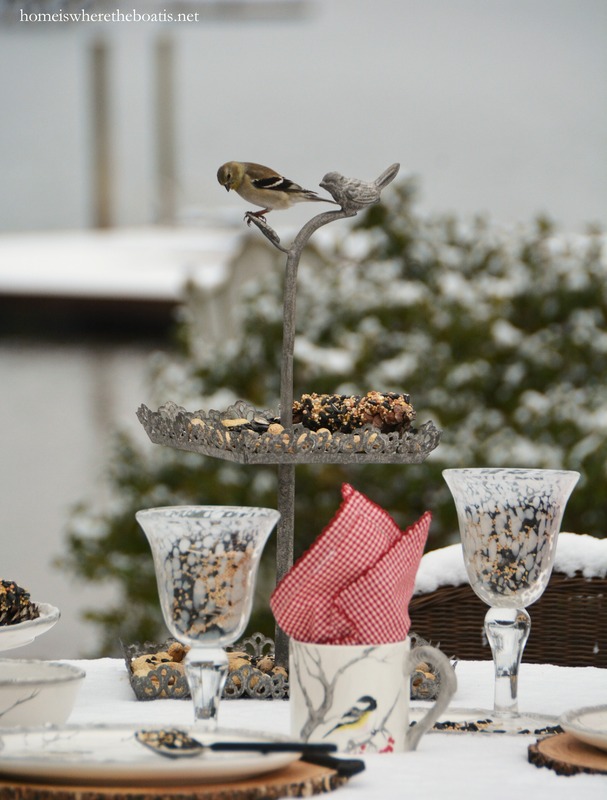 What a fun filled snowy tablescape for the friendly birds, Mary. 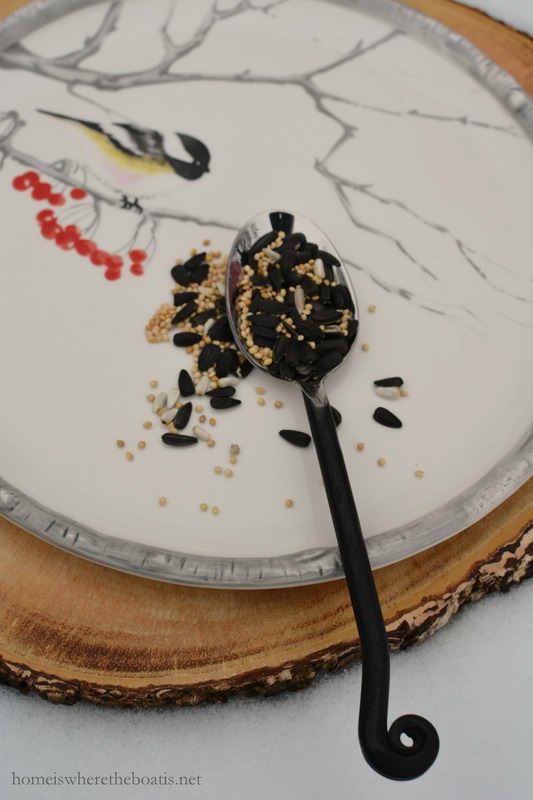 The tired tray is so sweet for serving the bird seed. 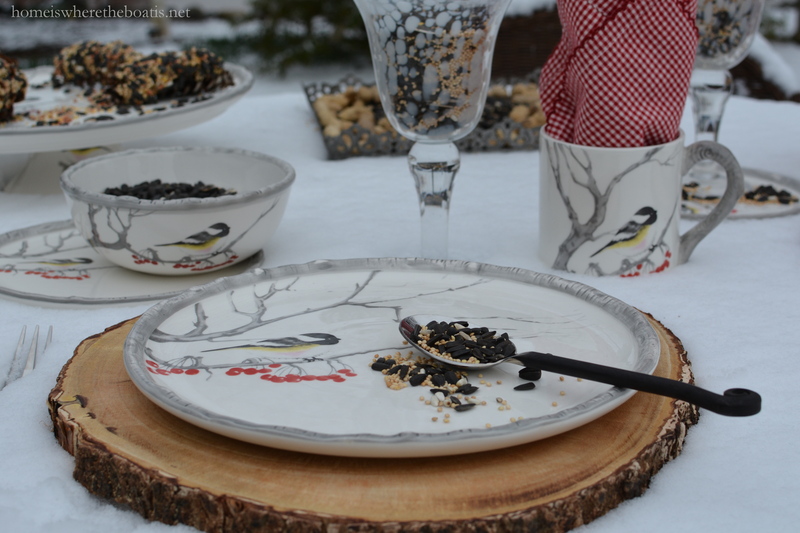 The pretty chickadee plates add a touch of color, as do the cardinals and the gold finches. The squirrels are cute, but I can do without feeding them! Love love love your table setting!!! Such a beautiful feast for our feathered friends. We also have many bird feeders. Its been snowing here in the midwest and yesterday before I got home from work, my husband said there were about 20 cardinals in the yard..he went to get the camera and quite a few flew away. Cardinals are very special in my family. :) We also get finches, blue jays and what I really love is our parrots we get. Just beautiful. 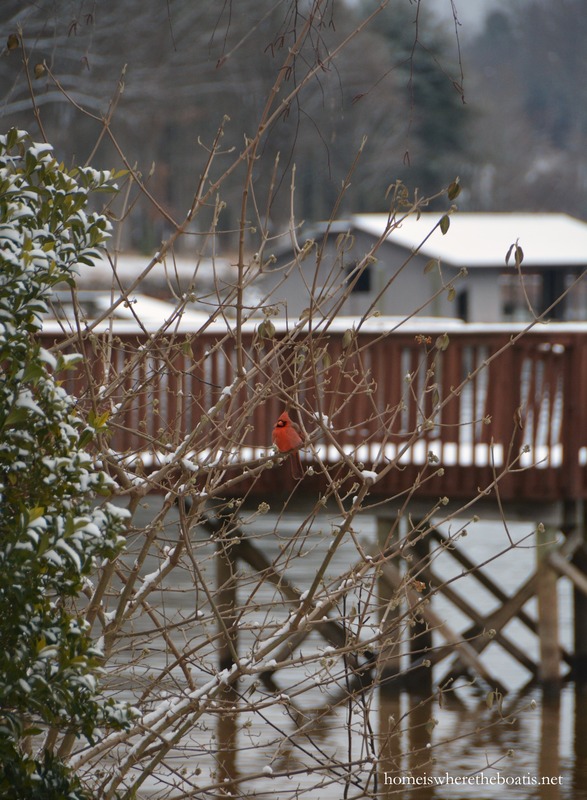 It will be snowing really hard and the cardinals and the bright green parrots are feasting in the yard.ah..so pretty. Oh I just love the pic of the cardinal on top of the white bird house. .gorgeous! Just beautiful! I, too, keep out a bird feeder and also suet cakes. I love watching them from my kitchen window. I do not, however, want squirrels hanging from the feeders. Here’s how I stopped it – just take an aluminum pie tin that you would normally throw out. 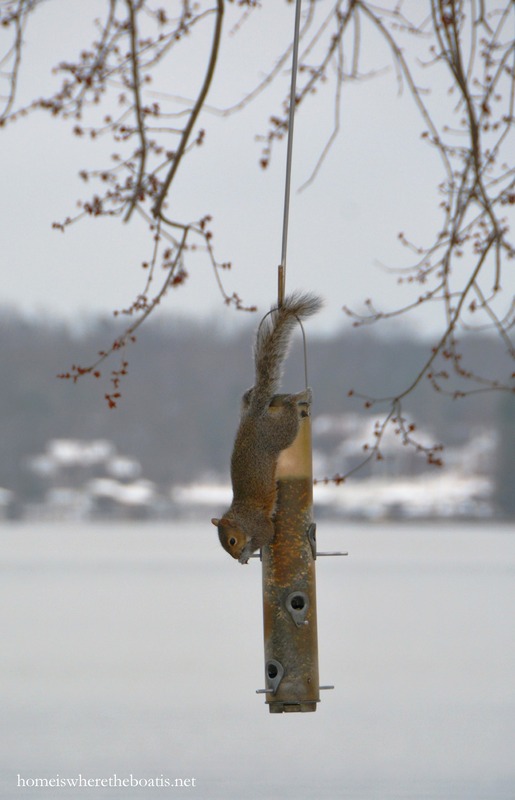 Make a small hole in the center and slip it down over the top of your feeder. It won’t keep the birds away but it’ll keep the squirrels off. My squirrels have to eat their birdseed off the ground where it’s knocked from the feeders by the birds. What an absolutely delightful tableau! The birds were certainly honored guests! 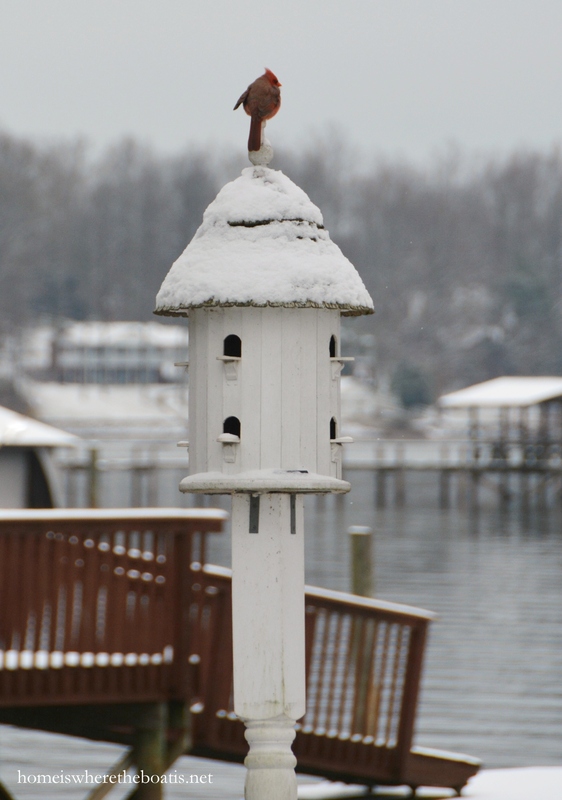 What a lovely setting for your feathered friends. We are bird lovers too and make sure our feathered friends are well fed. Since having 7 inches of snow a week and a half ago, this morning’s snowfall has brought 5 inches so far. Enjoy your day. What an incredible idea, now I’m missing my home up north, I’ll be sure to copy this when I go back in the spring…..into the back woods. Love it, keep up the great work, love, love love your blog. 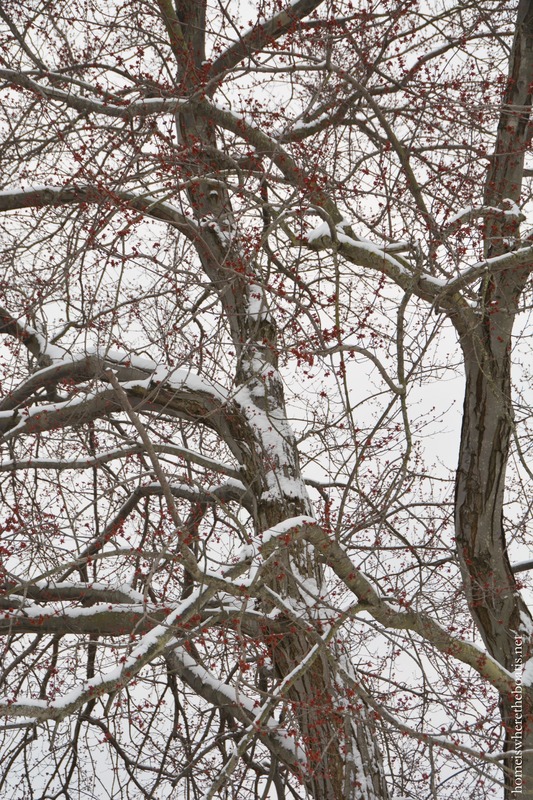 What kind of tree is the one in your photos with the red berries? I bet the cardinals love it. The table you sat for the birds is darling…I love it. Such a pretty table setting. I love the idea for the birds. The squirrels would take over at my house. Love your table setting! Such a pretty idea. We still have about 4 ft of snow on the ground here in MA. 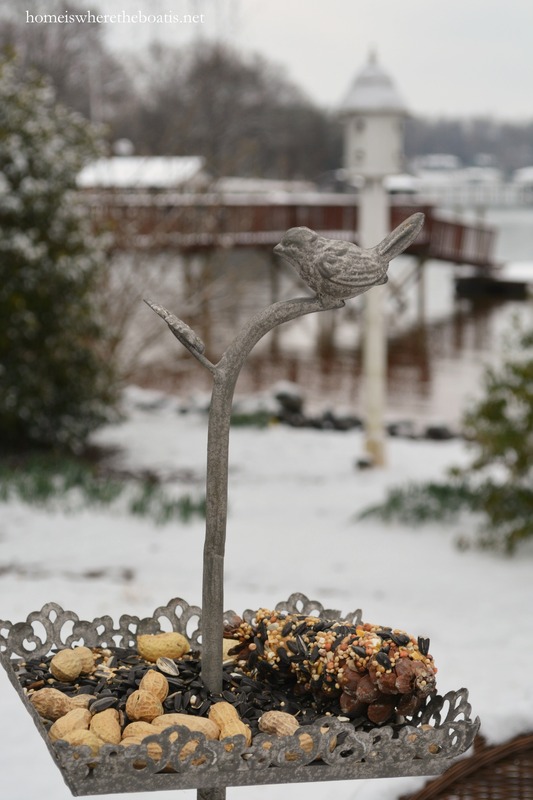 I keep bird and suet feeders out, but I love your idea of the tiered piece with peanuts and birdseed. So pretty. You definitely have a great creative gift. As naughty as the squirrels are, they are so fun to watch! 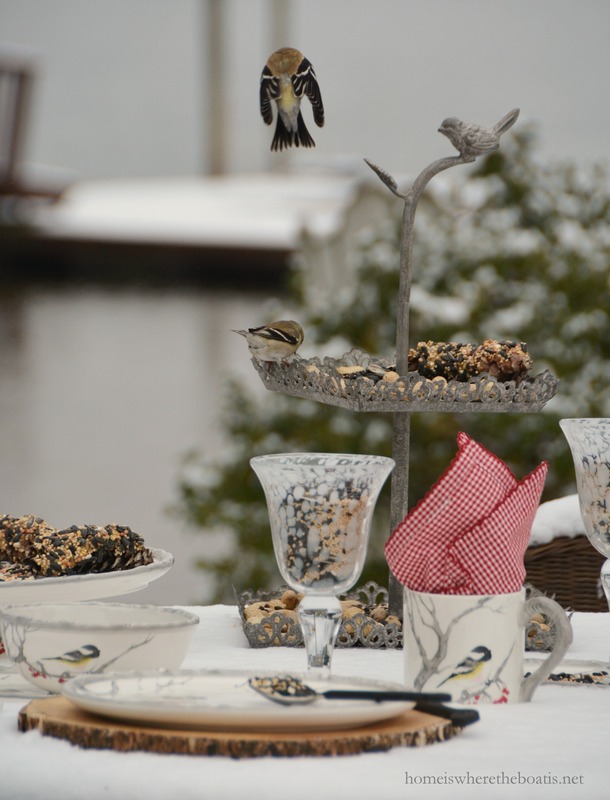 I love that you caught the birds on the tablescape enjoying all that you set out for them. We have had pretty much a snow-less winter with the exception of Christmas Eve when it dumped. I always love the snow on my tables in the backyard too. 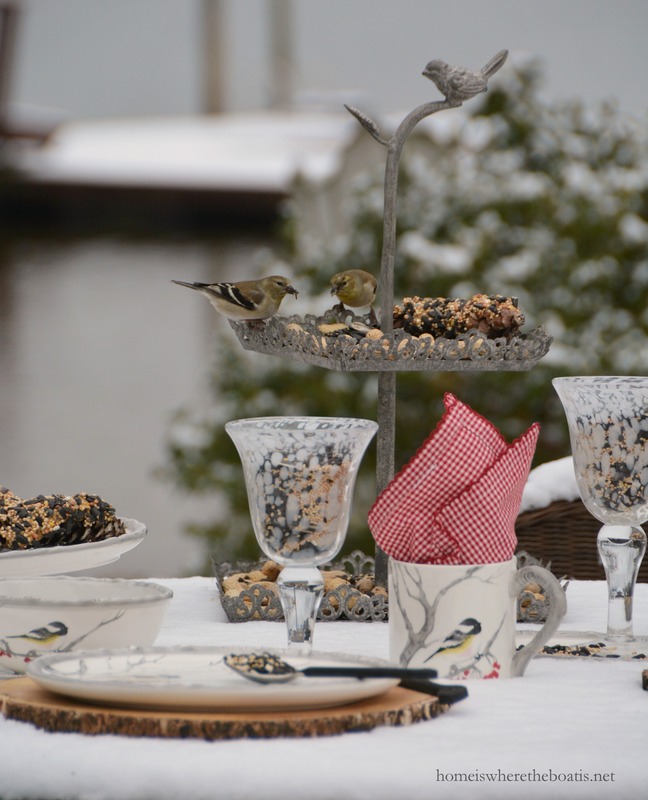 What pretty plates those are, so perfect for this table for the birds. What a lovely table you set for our feathered friends. I, too, love feeding and watching the birds, especially the finches, chickadees and cardinals this time of year. Thanks for sharing a post so dear to me. Very creatve, Mary! You treat your birds well. Just wanted to remind you the 7th annual St. Patrick’s Day Blog Crawl is on Mar 11. Could you remind the blogger who you sent the traveling shamrock cloth about it? Thanks! Come on out to Southampton and enjoy our snow. We’vehad 3 ft on the ground for weeks, and more on the way today and this weekend! Enough, I say, but Mother Nature ignores, lol! Dreaming of above freezing temps! 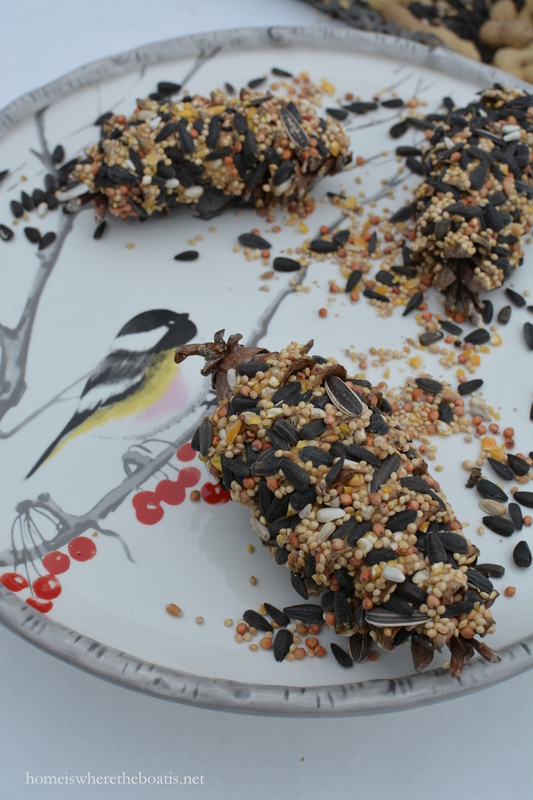 Beautiful table for the birds, love the dishes, chickadees are one of my fav birds. 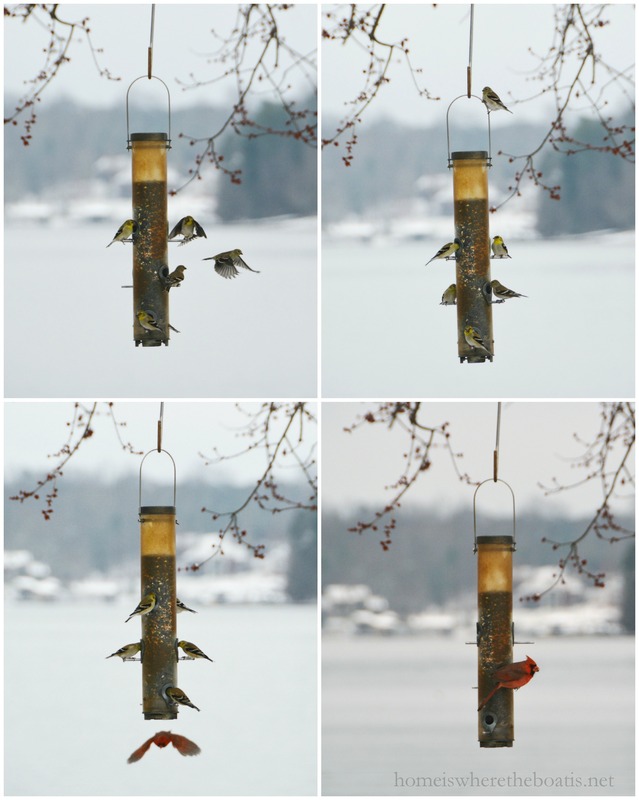 We feed all year long and love watching the variety that comes to our feeders. The American goldfinch is the state bird of Iowa and we love watching them change colors thru Feb and March. It wont be long now and we will have to put out grape jelly for the Orioles. Next will be the hummers when the coral bells bloom. Birds are such a treasure. Grape jelly for Orioles! Do you mix seed with that? I so love this table and the chickadee dishes that I have them on my wish list. Gorgeous, as usual. Thank you for making my day. So pretty! 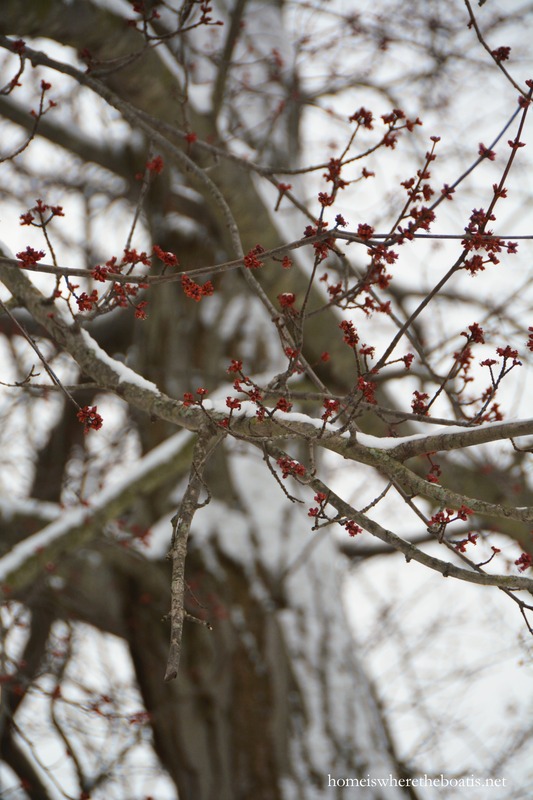 We are having an unusually early spring here in Oregon…wish you could send some of your snow our way! Awwww. Love setting the table for the birds. So genius! We still have about two feet of hard crusty snow here in Stony Brook, Long Island, and are being threatened with more on the way. 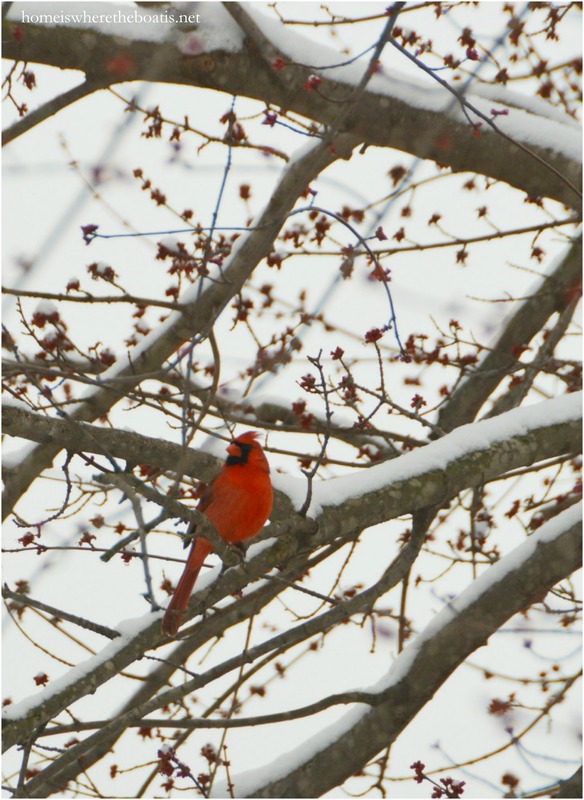 So many of our feathered friends are hiding out until they’re sure the last blizzard has come and gone. Wouldn’t it be neat if they found a setting similar to this on my back deck. I don’t have a lake, but, do have a duck pond. Do so enjoy all your creativity. I would LOVE to be a bird in your neighborhood! 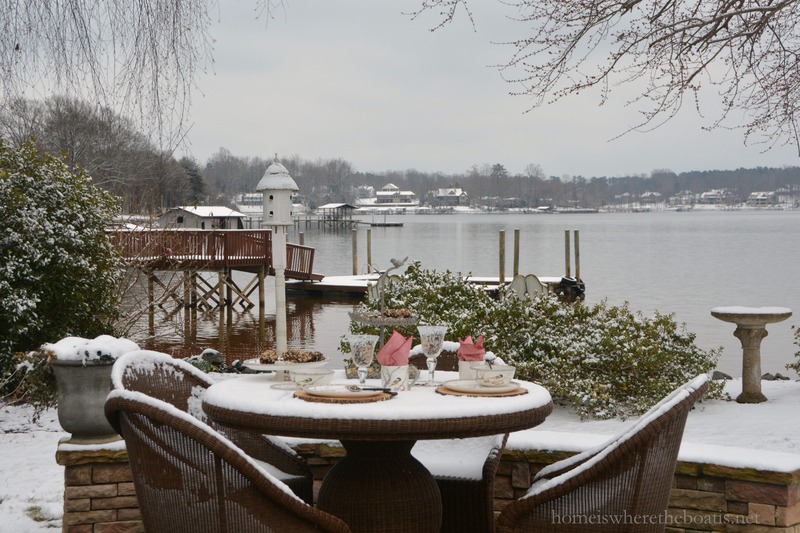 Mary, I know the birds must be flying in from all around Lake Norman. Who would want to miss this dinner party? As always, your clever creative self gave us all a bit of joy on this cold winter morning. Not so gray here today as has been. I can see a bit of blue trying to show through the heavy cloud cover. Stay warm! Thanks for sharing these amazing shots. Oh, what a darling blog this is, Mary! I am 1 of many; holed up in the Midwest, waiting out the weather. You have brought us much joy with your delightful ideas once again! Be abundantly blessed! I think this is your finest tablescape ever! Lovely and inspired and the guests of honor are all delightful. Fabulous job. I also want to congratulate you on the magazine spread of your beloved potting shed. Such a well deserved shout out. Bravo! I have those same plates. IF my table were outside I would be out there doing a table for our birds!!! I love that you caight a picture of the birds at the table!!! Your pictures are just beautiful. We were supposed to get snow this morning but it by pased us. I am just as happy. I am READY for Spring! The birds and squirrels in your area must be very grateful! Beautifully done !! I too love all those birds, but my favorite is the Blue Bird+ they say it is the bird of happiness. I never had them before and in the winter of 1999 my dad passed away, and weeks later these little birds showed up sitting on my fence. I say a message from my dear daddy to be happy ! Any hoot your pictures are beautiful and the little squirrel made me giggle ! I love this! I would never have thought to set a table for the birds. What lovely pictures and such a pretty view! Such a cute idea! Love the photos! Hospitality designs featured your magazine spread! I didn’t know! I can’t wait to go and get a copy. I always love and admire your shed. If I can’t find one, I know they have it on Amazon – how wonderful! I apologize from the start but couldn’t find an email to send a private message. I’m starting a blog and I”m considering the Gridiculous Pro Theme and noticed you use it. I have someone that can customize it for me but as a beginner, will the “Pro” part make it more advanced to use as far as posting, and the daily task? . DO you like this child theme and would you buy it again? I hate to be “”out of control” with things I know nothing about. New to blogging and certainly new to themes and the other fancy words the blogsphere uses. Many thanks Love your blog. Your photos are gorgeous and I, too, love feeding the birds especially in winter. We barely got a dusting of snow here in the Atlanta area. I was thrilled the other day to see a blue bird at my feeder! Mary, that photo of the bird on the opposite branch of the tiered server is just amazing! We had a dusting of snow a few days ago and just sleet and rain last night. Thinking that we may need to start building an ark! Enjoyed your tablescape for the birds so much! Love it Mary! On vacation today and with the temp at 12 degrees I am at my dinning room window seat watching my birds. Had 5 blue jays, 4 male cardinals and 4 females with many Chickadees, Juncos and Tufted Titmouse (Titmice = plural ? ha) and the Finches. What a joy to watch. Yes, Mr. Squirrel is a pest, but I guess he has to eat too! I even have a feeder outside my work office window. It is my sanity when things get crazy and that is a regular thing. haha. Glad you are enjoying your snow. In MI, on the thumb, we’re still at around 3 feet of snow and counting the days until Spring! you live in Jersey, right? I live ‘down the shore’….I do attract the yellow finches all summer with my wild sunflowers, but then they go away? how can I attract these finches to my yard? I have a finch sock, but I hesitate to put them out with this horrible weather we’ve had. ugh. 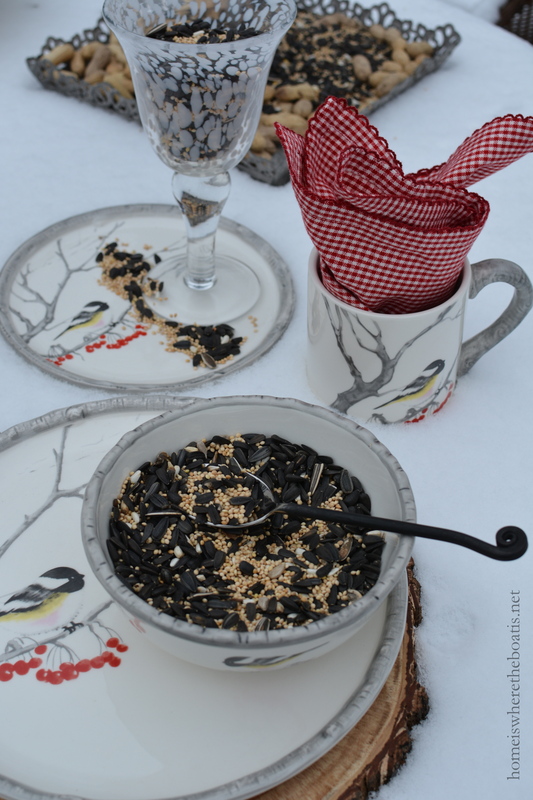 but I love the table setting for the birds, I mean, I’m not sitting out there for dinner anytime soon, so why not??? great idea!!! thanks!! I wish I was a Bird!! 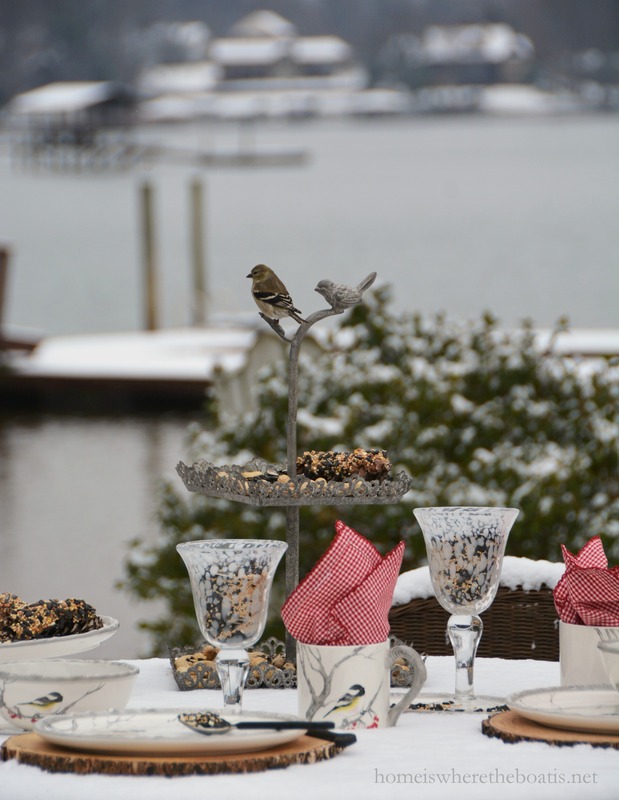 Love the tablesetting and the snowy background. Looks so peaceful. All of those adorable little critters, so sweet, and the lake looks gorgeous, like a winter wonderland! I love those wooden chargers, what a perfect addition to your beautiful table. Love this post with the birds! How beautiful ! I love the cardinals and squirrel, how happy they must feel roaming around your property.